New Research based medicines bring superior results at Life Force. Pulmonary renal syndrome is a rare disease condition, which affects lungs and kidneys at the same time simultaneously showing sign and symptoms of bleeding in lungs and kidney damage. Pulmonary means ‘of the lung’ and renal means ‘of the kidney’ while syndrome means a cluster of symptoms. Pulmonary renal syndrome is a condition resulting from underlying autoimmune diseases such as systemic lupus erythromatosis, systemic sclerosis or other connective tissue disorders. The diseases which affect multiple organs at a time are responsible for development of this condition. In this disease there is inflammation and destruction of small arteries, veins and capillaries of lungs and kidneys. Some changes may be suggesting of glomerulonephritis, that is, inflammation of some parts of kidneys. Sign and symptoms related to kidney damage and lungs affections may be present at the same time or at different times. Owing to bleeding tendency this disease can be life threatening. Bleeding along with cough (Hemoptysis). Kidney affection results into glomerulonephritis. It is often diagnosed when other causes of bleeding in lungs such as pneumonia, bronchiectasis or cancer are ruled out and there is enough evidence of kidney damage along with lung affections showing bleeding of the small tube of lungs called alveoli. Confirmatory diagnosis can be done through biopsy of lung and/or kidney. Lung biopsy may show small vessel vasculitis and kidney biopsy may show signs of glomerulonephritis. Basic line of treatment is the use of corticosteroids to suppress the immune system. Cyclophosphamide is required along with corticosteroids in advanced stage of the disease. At Life Force, we have encountered only one confirmed case of Pulmonary renal syndrome by July 2014. Looking at the immunological cause and the pathological changes involved in the disease, in Dr Rajesh Shah's view, Pulmonary renal syndrome can be helped symptomatically with homeopathy. Homeopathic medicines can help control bleeding episodes, help in controlling the underlying immunological process and support the conventional treatment. Homeopathy is strongly suggested as a support measure for Pulmonary renal syndrome. 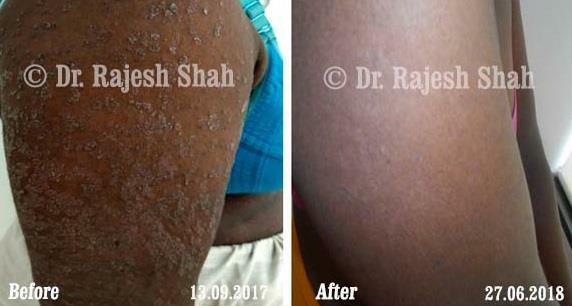 Psoriasis Which Ran into Cellulitis Eventually Gets Treated with Homeopathy. Menses regularised with homeopathy in an old case of PCOD.